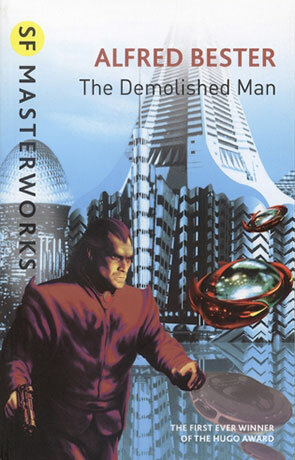 The Demolished Man was the first ever novel to win a Hugo award for "Best Novel" in 1953. As with much of Alfred Bester's works, it remains an understated classic. The novel is set in the 24th Century with a society who can no longer hide their crimes following the rise of police telepaths (known as Espers). Anyone caught carrying out a serious crime is "Demolished"; their mind erased. For Ben Reich this poses a serious problem. Haunted by nightmares of the Man with no Face he feels compelled to murder a rival magnate. He does however have the considerable resources of a business Empire, a weapon with some strange ammo and an insane jingle to mask his thoughts. Is that enough to keep him from the Mind reading abilities of police chief Lincoln Powell? You don't see Telepathy mentioned much in the 21st century but back in the 20th Century it was often used in TV, film and literature. Bester paints a more realistic picture than many, describing some of the problems that come with such a gift. It's a singular experience in that respect and the author manages to envisage such a gift (or curse) through some clever dialogue and even cleverer use of sentence structure. I liked the way Esper police still have to find physical evidence of a crime and can't just rely on their Esper ability for conviction - it's a touch that adds plausibility. The story is gripping and expands into this fascinating cat and mouse game between Reich and Powell. The vsion of the future that Bester paints is uncluttered by descriptions of technology and as such feels timeless, it has aged well. The vernacular does date it slightly however, it's got a flavour of the 1950's however this is a minor point and doesn't really detract. It's quite a slim book and there is little wasted space, the pace is fluid and accelerates as the book nears it's quite spectacular finale. The end is pure genius and executed brilliantly. This book though is really all about the characters and at the time must have seemed quite revolutionary, dealing as it does with the ideas of ID, Ego and Super-ego. The author provides the characters with phycological disorders that feel totally natural and he describes them effortlessly. For anyone who has studied the works of Sigmund Freud there does seem to be a relation to his theories and the plot makes more sense in a Freudian context (although I'm not sure I'd go as far as some and suggest Reich as an Oedipus complex). There are a few signs of old-school thinking though, there is little in the way of feminism - in that respect the book is firmly rooted in the 20th century. The real star of the show is Bester's description of the Espers. I've not read a book that has quite managed to capture the gift (and curse) of telepathy the way Bester does. It is simply incredible. The Demolished Man is without a doubt a timeless classic. It's been Influential within the genre and entirely deserving in it's place as the very first winner of the Hugo. Written on 6th August 2014 by Ant.